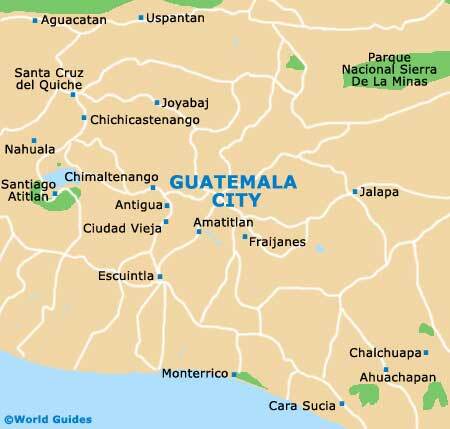 The capital of Guatemala is also the main and largest city of the Central America region. Divided into numbered zones (zonas), set within a valley and surrounded by mountains, Guatemala City (or Guate as it is affectionately known) is a modern metropolis with some interesting old sections and high crime levels. This is what puts most tourists off visiting Guatemala City and tourism in general suffers as a result, although there is no denying that the city has a certain draw, energy and fascination that attracts a certain type of visitor. You can still have a good time, but always need to be on your guard and watch where you stay. Attractions in Guatemala City include impressive squares and churches, old ruins, colourful markets, the lively Zona Viva bars, and some funky museums with exceptional pieces. The city is working hard to improve its image and overall tourism appeal by cleaning itself up, adding new public spaces, upgrading public transport and hosting big weekend events. Guatemala City tourist information is best sought at the Guatemalan Tourism Institute (Instituto Guatemalteco de Turismo - INGUAT) office on the Avenida 7a, within Zona 4's Centro Civico and close to the Cuatro Grados Norte bus station. Additional INGUAT tourism outlets can be found at the Mercado de Artesanias in Zona 13, as well as at nearby La Aurora International Airport. If you are just passing through Guatemala City, on your way to Antigua, then perhaps allow time for the TransMetro SubiBaja bus tour of the main sights. This leisurely tour will take in Central Park (Parque Central), which is also known as the Plaza Mayor and is flanked by many gorgeous buildings, being regularly used to host celebrations and military displays. The bus will also visit La Aurora Zoo (Parque Zoologico La Aurora), which always appeals to families and contains all of the expected exotics. Also on the route is the pedestrianised promenade named the Cuatro Grados Norte, where a high concentration of restaurants and bars await, and the rather touristy Relief Map (Mapa en Relieve) - a giant 3D-map in Minerva Park (Parque Minerva) showing the country as it appeared roughly 100 years ago. Alternatively you may like to pay a visit to the Guatemala City Botanical Gardens (Jardin Botanico) at the University of San Carlos (Universidad de San Carlos) in Zona 10, or perhaps catch a football match or other sporting event at the Mateo Flores National Stadium (Estadio Nacional Mateo Flores) in Zona 5. More information about Guatemala City Tourist Attractions. Tall, gleaming skyscrapers in central Guatemala City contrast with the outlying shantytowns and provide a stark disparity between wealth and poverty, and indeed many of the big-money cars on the street often look out of place next to the old buses. If you are here to sightsee, then some of the oldest and most noteworthy buildings are clustered around Zona 1, such as the National Palace of Culture (Palacio Nacional de la Cultura) and the Metropolitan Cathedral (Catedral Metropolitana), both of which overlook the Parque Central. Further landmarks living in Zona 1 include the Baroque-style Church of Saint Francis (Iglesia de San Francisco) and La Merced Church (Iglesia La Merced), along with the more modern Miguel Angel Asturias Cultural Centre (Centro Cultural Miguel Angel Asturias) entertainment complex, regularly referred to as the National Theatre (Teatro Nacional). Located in Zona 7, the Kaminaljuyu Archaeological Park (Parque Arqueologico Kaminaljuyu) features ancient ruins of a pre-Classic Maya city dating back almost 2,500 years. More information about Guatemala City Landmarks and Monuments. As the capital city, Guatemala City manages to boast the country's very best museums, with an enviable selection to choose from, housing some real national treasures. Particular highlights include the National History Museum (Museo Nacional de Historia) in Zona 1 and the National Museum of Ethnology and Archaeology (Museo Nacional de Etnologia y Arqueologia) in Zona 13. Families on holiday in Guatemala City should be sure to check out either the Natural History Museum (Museo de Historia Natural) in Zona 10, where fossils and a butterfly house will captivate young minds, or the Children's Museum (Museo de los Ninos) in Zona 13, with its centrifugal force simulator and earthquake simulations. Art aficionados should not miss out on a trip to the National Museum of Modern Art (Museo Nacional de Arte Moderno) in Zona 13, which exhibits a large collection of works by important Guatemalan artists. More information about Guatemala City Museums and Guatemala City Art Galleries. Although Guatemala City may well be something of an acquired taste and is perhaps not the best holiday destination in Guatemala, it does serve as a useful jumping-off point for a number of appealing excursions. At just 45 minutes to the west, Antigua is actually the former Guatemalan capital city and now ranks as a prestigious World Heritage Site, with palaces, churches and museums. A similar distance away, only this time to the south-west, is Ciudad Vieja, a city shaped by volcanic activity and located close to the Water Volcano (Volcan Agua). Further afield, you can enjoy excursions to the seaside resort of Monterrico, hiking around Lake Atitlan (Lago de Atitlan) and shopping at the busy market in Chichicastenango. At under an hour to the south of Guatemala City, the active Pacaya Volcano (Volcan Pacaya) measures in at (2550 metres / 8,366 feet) and is connected by regular tour buses. More information about Guatemala City Attractions Nearby.